Were back with another California Institute of the Arts student and its not because there paying me to publish their students work, but the creative’s coming out of Cal Arts are making some serious noise online already, and they’ve not even graduated yet. The guilty party this time is twenty something Michelle Xin who has now completed her third year and this pronounced piece of animation formed part of her grading for that particular year. 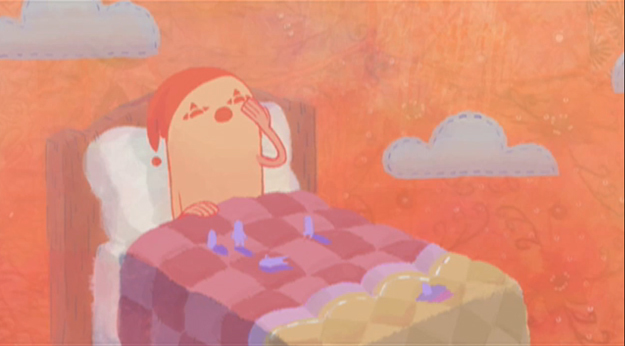 Sun Guy is an uplifting short animated visual works which is engaging and entertaining throughout. Crafted with an imaginative plot based around one large creature who protects the brash energetic younger pack, one day another species lands on their home and changes everything.Michelle Xin is currently setup online through a small blogspot so head over via the link below for more views of her workings.